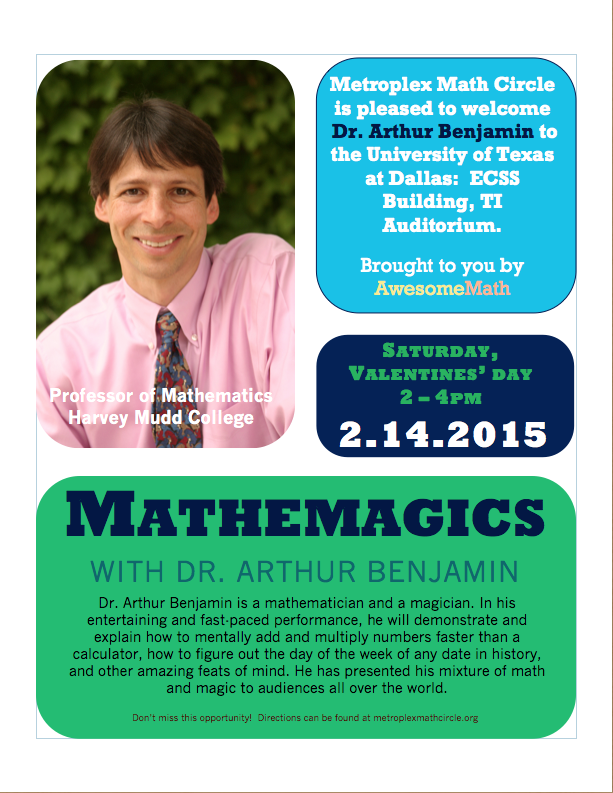 February 14, 2015 – Dr. Arthur Benjamin – Mathemagic! Don’t miss this amazing opportunity to see Dr. Arthur Benjamin, a Professor of Mathematics at Harvey Mudd College, perform his Mathemagics show this Saturday. He has delighted a global audience with his mixture of math and magic and now Metroplex Math Circle will be able to enjoy this fast-paced and entertaining performance. The event will be held in the TI Auditorium of the ECSS building on the campus of UTD. This will be a popular session, so come early to ensure a seat. This connection between entertaining number tricks and the deeper properties of mathematics reflects Dr. Benjamin’s specialty, which is combinatorics, the branch of mathematics that deals with the subtleties of counting. Some examples: How many different six-symbol license plates are possible? And for the book collector, how many ways are there of arranging 10 books on a shelf? (Would you believe more than 3 million?) These simple questions introduce concepts such as the factorial function. — Martin Gardner, author of Mathematical Magic Show and hundreds of Mathematical Games columns for Scientific American. Metroplex Math Circle is very pleased to announce a special presentation by Dr. Arthur Benjamin, November 19th, 2008 at 7:00 PM in the TI Auditorium, room 2.102 in the Engineering and Computer Sciences building (ECSS) on the campus of the University of Texas at Dallas. Dr. Benjamin is a very distinguished mathematician at the prestigious Harvey Mudd College who has authored multiple books and scholarly papers. But he is also very well known as an entertainer and “mathemagician.” Dr. Benjamin’s program should be inspiring and entertaining for adults and students of all ages. Week of 11/17 – Dr. Arthur Benjamin! In November Metroplex Math Circle will help sponsor a special presentation from Dr. Arthur Benjamin! Dr. Benjamin is a distinguished mathematician at Harvey Mudd but also a very entertaining “mathemagician” whose shows are commissioned by many corporations and institutions around the country.